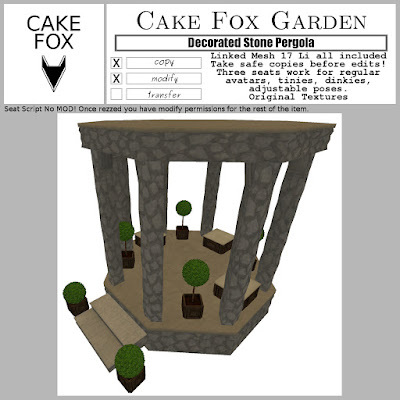 Cake Fox: SWAG works for regular avatars, dinkies and tinies! SWAG works for regular avatars, dinkies and tinies! Cake Fox Garden Decorated Stone Pergola. Mesh 17Li everything linked. Three seats all work for regular avatars, dinkies and tinies with adjustable poses. Up for SWAG for just 50L$ this weekend! In the SWAG vendor at Cake Fox SWAG location (demo item rezzed at the location).